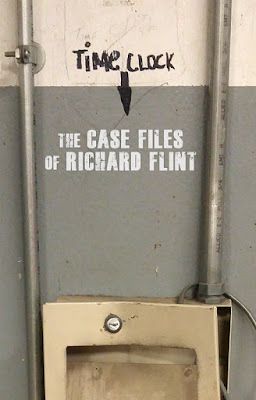 TIMECLOCK: The Case Files of Richard Flint started in my mind as a pen and paper role playing game; a whole universe of doorways and ideas for my friends to play. It was pure fantasy science-fiction, and no main characters. From there, it evolved into a Doctor Who style adventure story concept, under the working title A Vague Study In M-Theory. I constructed characters to follow, creating some form of a bootstrap paradox, and involved some dimensional void "from which there was no return." I filled notebooks with mathematical equations, explanations of each dimension into the double digits, and their correlations with colors and various principles of physics. I wrote down fragments of dialogue, little plot devices, and portions of scenes, with no sense of how they would fit into the bigger picture. After a half a decade or so, I took a picture of an old broken punch time clock frame in the basement level of my work, and the words written above it gave me a new name. Apparently, at some point in my notes, I contemplated abandoning any actual time clock being involved in the story whatsoever; an idea that stuck with me until recently. The whole thing got tucked away into a storage bin, allowing me to focus on writing a dozen or so episodes of an audio play, hopefully to be made someday. A few years later, I began work on a second audio play concept, in the form of a noir detective story about an man who wasn't a detective. I dug out my old story ideas simply to pilfer the title and lead character name, and began to write. The play evolved into being a book, and then fell on the back-burner due to a brain injury. When I felt I could pull up creativity, language comprehension, and the will to write again, I picked the pen back up again, so-to-speak, and carried on from where I left off... which for the record, was hardly even a chapter in. Eventually, I stumbled back onto my old notebooks of ideas and concepts, and I realized that some of the more abstract bits had inadvertently made their way into what I had just written... Fragments of disconnected dialogue matched up with plot points I had already set up... Things started to fall into place very quickly from there. I shuffled a few more things around and laid out the groundwork for where I wanted my new, yet old, story to go. Nothing so severe to feel penned in or like I'm writing myself into a corner, but just enough of the "big picture" that wherever my off-the-cuff writing style takes me, I can still be directed to a goal. I had initially begun posting the segments to my blog here, but once I found Wattpad, I knew it was made for how I want to write. Instead of solid chapters, I chose to write in a weekly serialized story structure, similar to the old newspaper periodicals. Sherlock Holmes being one of the more famous weekly-released stories, bringing us back around to the detective style narration. So every week, usually on Thursdays or Fridays, I drink a Red Bull or two, shut off my brain, and start to write. The following Mondays (or Tuesdays, when things are hectic), I post an "entry" (instead of chapters) to my book... which may simply become the first of a small series. To read my ever-growing story, click the image below to go to my Wattpad profile. 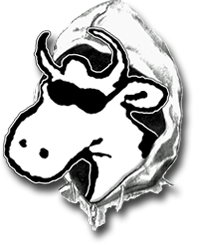 Please follow me, comment anywhere in the story, and hopefully enjoy my brain-dump!